As the London Mayoral election approaches, it seems like a good time to consider Uber, a company that has divided opinion in the city. The black cab industry has suffered since the emergence of Uber and its online app. Rows have arisen over regulation, metres and customer safety. City streets have seen several gridlock-causing protests. Mayoral front-runner Sadiq Khan has threatened to cap the number of private hire vehicles, whilst stressing that drivers should have a good basic level of English. In light of all of this attention, how has Uber fared over the past year? The YouGov BrandIndex Awareness metric shows that more people know about the brand now than when we started to track it in June of last year. During this time its awareness score has risen by 26 points. There is a similar trend concerning Uber’s WOM (Word of Mouth) score. This metric, which measures whether a respondent has discussed a company with friends, family or colleagues in the last two weeks, shows that Uber is currently registering its strongest ever score. Awareness is one thing but does it translate into customers? On this front, there’s more good news. Since last June there has been a gradual increase in the number of respondents who would consider using the service – and, again, Uber is currently at its highest recorded level. It is not all good news, though. Purchase consideration among women aged 18-34 is currently in decline. Uber’s score in this age group has dropped seven points since late February, suggesting that some of the negative headlines have hit the brand’s perception. 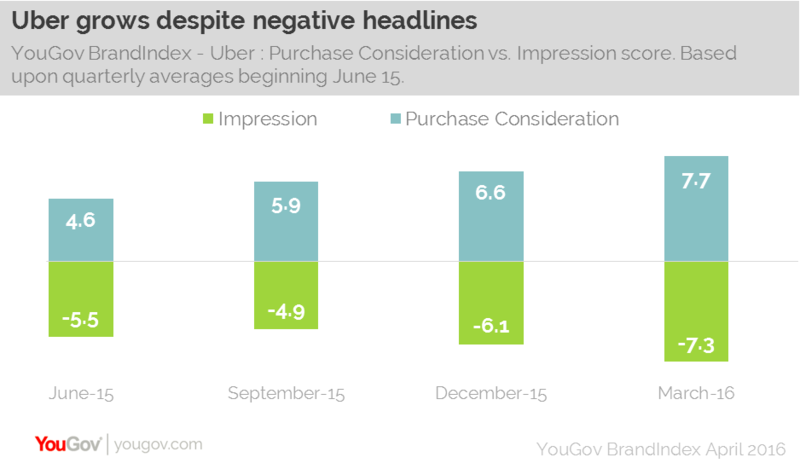 In fact, Uber’s overall Impression score has decreased since June. It seems as though that despite some bad media coverage and discussions about the brand’s battle with London’s traditional black cabs, consumers are still being drawn to the app upstart by its convenience and price benefits. That is not to say that consumers do not value the black cab trade. Many in the capital will hope that competition will spur the traditional Hackney carriage to adopt new technologies such as contactless payment and Wi-Fi. It is clear that the battle is just beginning.